Occasionally a book comes along that acts as a key, unlocking something that was previously inaccessible. 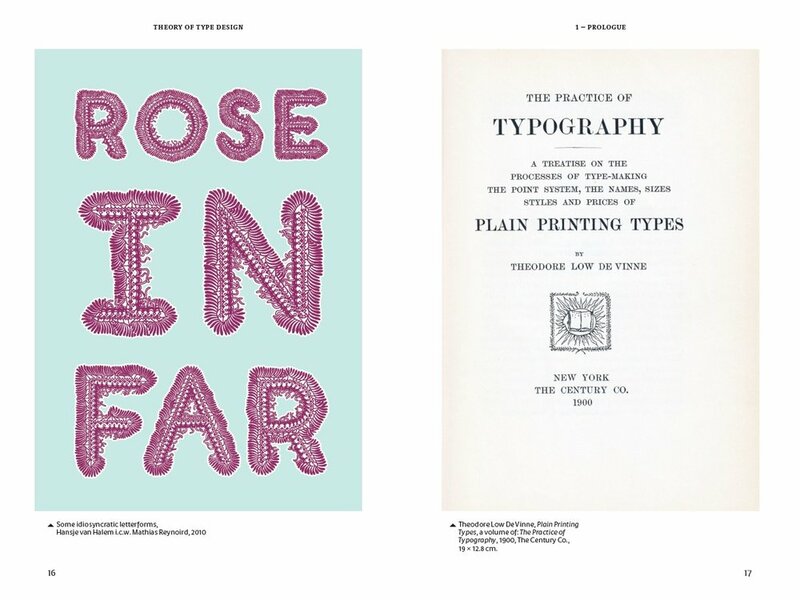 Gerard Unger's new book the Theory of type design, is that kind of publication. In the foreword, Gerry Leonidas positions the book as having the potential to transform both education and discourse in type design. I just had the good fortune to preview a copy and I couldn't agree more. Gerard Unger is a name often echoed dialogue about in type education and practice, he is an internationally-renowned Dutch graphic designer and typographer. In his teaching roles, Unger has also helped shape some of the contemporary type scenes best and brightest talent. His educational experience is critical to the success of this text as Unger's writing style is incredibly generous, (rather than verbosely academic or egocentric). "Of all designed objects letters are probably the most pervasive," Unger explains at the beginning of his study. "Very familiar yet amazingly diverse in their appearance … there seems to be no limit to human ingenuity when it comes to varying letterforms." The thread of the text follows the thinking that the design of type is fundamentally a linguistic tool, and that type conveys meaning on multiple levels. The book is engaging and easily understood. Each of the chapters has the theoretical content grounded in its relationship to practice and is bolstered with rich visual examples (more than 200 illustrations). In Chapter 3 Unger eloquently introduces the relationships between writing, speaking, semantics and expression which is further expanded upon in Chapter 19 and 20 where Unger illuminates typographic allusion, association and the relationships between form and function in depth. Chapter 9's strokes and parts which examins construction and sequence in detail and would be an incredibly useful guide for Letterers and will certainly inform my professional practice. Chapter 13's exploration of optical adjustments demystifies the differences between what we see and measure when looking at letterforms, which is later supported by in-depth discussions on legibility and ergonomics of typographic form in chapters 21 and 22. The publishers will correctly tell you, this book has a broader reach than type design professionals, and that it is a must-read for students and professionals alike. My thinking is this is a book I wish was written sooner - but I am grateful exists now. Whether you're an art director, graphic designer, calligrapher, historian, print enthusiast or harbour any curiosity for the mechanics of visual language this book is essential reading. Newer:The chemise in typographyOlder:Nomada, is an editorial workhorse serving reader and designer.